Left are the two police officers who were shot dead yesterday December 20th while they sat in the marked police car in New York. 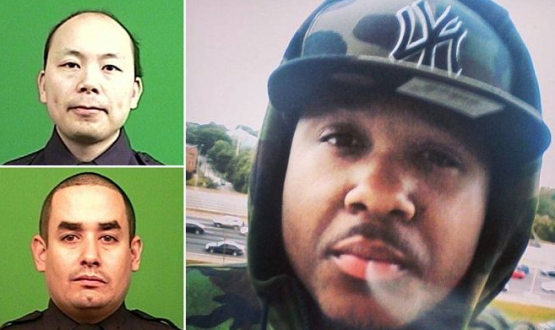 They are recently-married Wenjian Liu (top) and father-of-one Rafael Ramos (below) , and right is the man who shot them dead. He's been identified as 28 year-old Ismaaiyl Abdullah Brinsley, from Baltimore. Ismaaiyl had shot and wounded his girlfriend on Saturday morning before targeting the cops in an apparent act of revenge for Eric Garner's death based on what he wrote on his instagram page. Around 2.47pm yesterday afternoon, Ismaaiyl crept up behind a patrol car in Brooklyn's Bedford-Stuyvesant neighborhood and from the passenger side of the police van, he shot both men in the head execution style. Eyewitnesses said the police officers didn't get a chance to draw their own guns and didn't see their assailant. After the shooting, Ismaaiyl walked to a subway station and killed himself.